"it didn't feel like a cover band at all such was his command of all the material (even Stargazer! ), and I reckon the emphasis on the tribute aspect on the posters did more harm than good." "All in all a great night – really good to hear the new material, despite Graham's continuing trouble learning the words – the stage was almost literally wallpapered with lyric sheets. All of the oldies sounded great too – the band clearly enjoying themselves playing them, putting in a more convincing performance than you would have expected from a mere covers band (which they clearly aren't). "It is a fairly balanced set, with more Rainbow than MSG (Desert Song only); Alcatrazz (Suffer Me only) &, for me, the best songs from the Welcome to America album which I've had for a while now. The wonderful Station 208 always brings back memories of trying to get decent reception on a tinny little transistor radio! The album is a definite 'grower' & highly recommended for Bonnet & guitar fans alike..."
"My ears have only now recovered! (24 hours later). Great gig (although Graham came on after my bed time 22.00). Set list as already quoted. 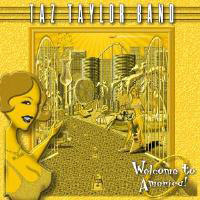 Taz Taylor Band were very good and professional and made all the right noises!. Forced to criticise Graham for shouting too much almost in every song which was a pity. After Stargazer (all words remembered) I thought I was back at Donnington for a minute. All I have to do now is meet my mate and get my autographed picture and cd purchased at the gig. Ps The Komedia club is a good venue with no rip offs!" "First time I've seen him live, brilliant show in a small but intimate venue. Was able to get right to the front no problem at all. Voice was still great and apparently (according to a roadie I chatted to) he was struggling with a cold, so God knows what he's normally like! Standard set list as rest of shows, opened with Eyes Of The World, finished with All Night Long and Since You've Been Gone. Encore of Lost In Hollywood. Night Games, Desert Song and Stargazer all made appearances. After the show he hung around for a while willing to chat to anyone, very approachable and signing everything put in front of him. All in all a very worthwhile trip to Nottingham and if you haven't caught him before then he's definitely still worth your time." "It's been a while now since his last solo album, with only Impelliteri, Elektric Zoo and Moonstone albums to keep fans of his patented rock bellow happy. But here's a full blown collaboration with fellow ex-pat and all round alien lookylikey Taz Taylor and his band to keep us happy. And, in places, it does make me happy. But let's look at what's good first with 'Fighter's Fist', 'Welcome to America' and 'Happy Hour' all being top notch eighties rock tunes that suit the Bonnet voice down to the ground. Things finish up with the bizarre 'Goodbye Mr. C' ; a coupling of the two Blizzard of Ozz tunes 'Goodbye To Romance' and 'Mr. Crowley', something which should not work, but does. 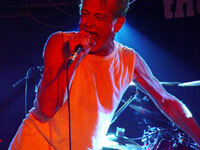 Graham actually gets the chance to sing rather than just indulge in the bellow he is best known for, and it's a strange but pleasurable closing to an album that, at its best, reminds us just why Graham Bonnet should be more than a footnote in the pantheon of rock and roll.. "